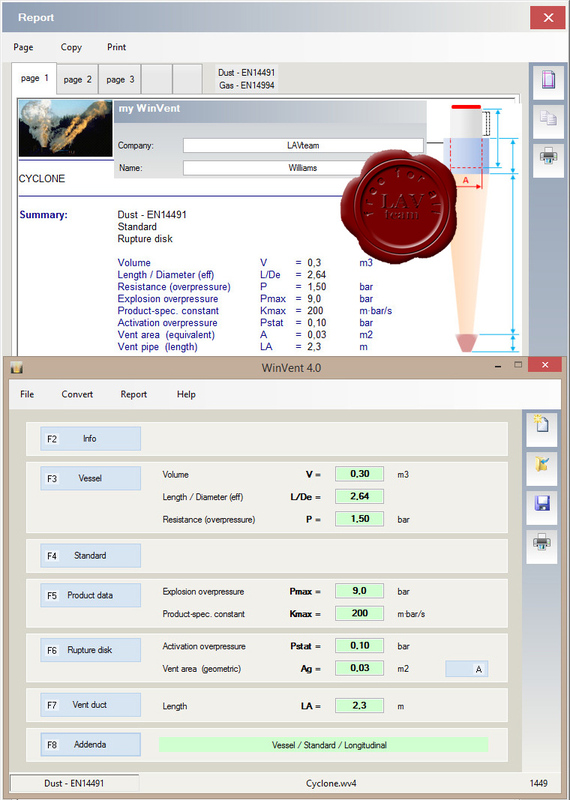 WinVent 4.0 is software for the Calculation of Explosion Protection Devices for Dust, Gas and Hybrid Mixtures. The software calculates all required information of the protective measure "Explosion Venting” for different equipment and enclosures containing dusts, gases, or hybrid mixtures. The calculations apply to single equipment where appropriate explosion isolation measures have been taken to prevent flame propagation into other connected equipment. Complete calculations are given by the maximum recoil force, the duration of the recoil force as well as the transferred impulse, the maximum flame length, flame with and external pressure in the vicinity of the vent opening. If inputs are not according to the standards, WinVent 4.0 informs you and indicates incorrect inputs.